Welcome to the first Full to the Brim post of the New Year! Today I'm starting out with a introduction to a new picture book challenge, hosted by There's A Book. 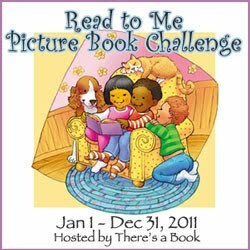 The Read to Me – Picture Book Reading Challenge runs from January 1st, 2011 to December 31, 2011, and the goal of the challenge is something I can get behind wholeheartedly -- reading together with my kids. It's a pretty simple challenge to join, especially if you already blog about picture books. Basically you just read a book with your kids and write a review (on a blog or Goodreads, Shelfari, LibraryThing, or Amazon). There are also various challenge levels. While I know we'll read the number of book required for the "Harvesting" level (200), I'm not sure I'll get around to reviewing all of those, so I'm signing up at the “Growing” level (120). There's a Monthly prize drawing for all participants, too, in case you need the extra motivation. aPARENTly Speaking - Book Giveaway Ends ?? Great to see your blog -- Not only am I looking forward to all the great reading, and the new books people introduce to me, but I'm looking forward to getting to know the new people that are brought to my Writing Room's computer screen through this Picture Book Reading Challenge! P.S. although my sign-in doesn't say so, "B" means elizabethanne of elizabethannewrites! Thanks for adding me to your giveaway list!